Check out the latest issue of fellowship! magazine! This issue features columns and stories on CBF church starting and women church starters, disaster relief efforts and much more. 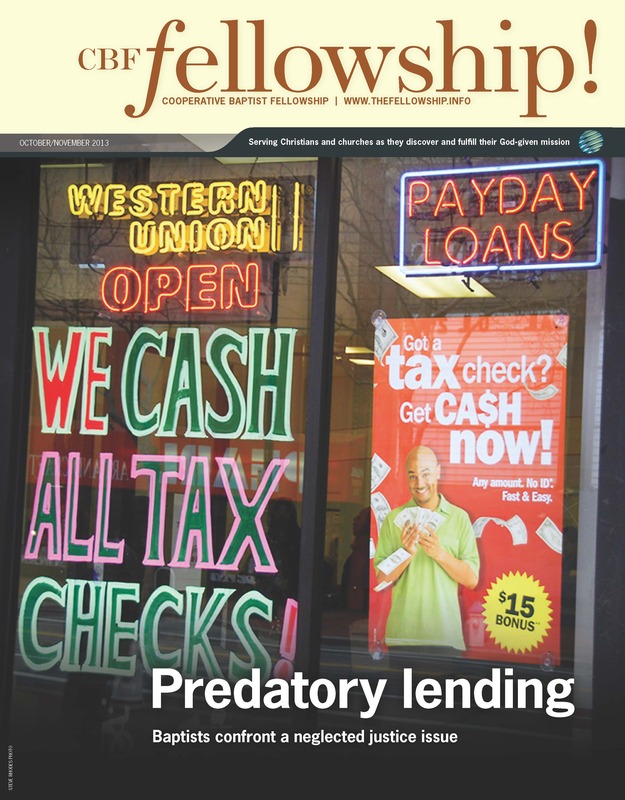 Read the cover story (pdf version) on the problem of predatory lending! Elliott is a Vietnam War veteran. Like a growing number of Americans, Elliott is underemployed and has lived paycheck to paycheck for quite some time. An emergency savings fund is a privilege that he has not been able to afford. When his wife Linda fell and broke her leg, Elliott panicked. With Linda unable to work, how would they make the next mortgage payment? To save their modest home, Elliott took out a $500 “payday” loan. But that small payday loan proved to be a bad decision, if he even had a real choice. One loan led to another and then another. Elliott was forced to take out additional loans, a loan to pay for the last loan. Two years later, he was trapped, paying the lender $450 every two weeks, never able to touch the principal for all the interest. Elliott eventually lost his home, spending more than $30,000 in the process. Elliott shared his very personal story with Jeanie McGowan, associate pastor at First Baptist Church of Jefferson City, Mo., and former CBF Coordinating Council member. “He couldn’t tell the story without tears,” McGowan observed. Unfortunately, Elliott’s story is far from unique. At a meeting of the New Baptist Covenant in Oklahoma in 2009, Stephen Reeves, then public policy director for the Texas Baptist Christian Life Commission, shared the story of a military veteran who took out a $4,000 title loan against his truck to help his daughter.Not able to pay off the loan in full, this veteran was charged a $1,200 penalty fee per month. “He could pay $1,200 each month forever and never pay off that loan,” Reeves told the crowd. A recent study by Pew Charitable Trust found that 12 million Americans take out at least one payday loan each year. These predatory laons allow a borrower to post-date a personal check for a small amount plus a fee, payable to the lender, in return for cash. The borrower is then obligated to pay back the entire loan at his or her next “payday,” generally due 14 days later. Interest rates on payday loans are usurious, often exceeding 500 percent for a two-week loan. 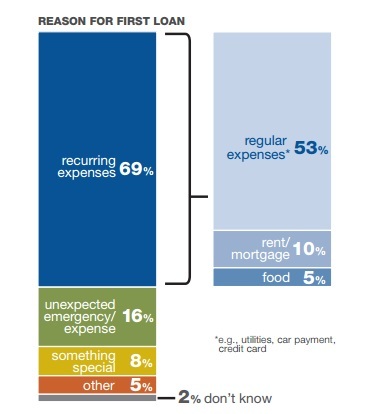 In Texas, the average borrower is likely to pay in excess of $800 for a $300 loan. Annual percentage rates on payday loans average just over 444 percent in Missouri, where rates on such loans can legally rise to as much as 1,950 percent. found that 12 million Americans take out at least one payday loan each year. The Insight Center for Community Economic Development determined that payday loans cost the slowly-recovering U.S. economy almost one billion dollars and over 14,000 jobs in 2011. Their study concluded that, had consumers not paid predatory lenders $3.3 billion in interest, the economy would have enjoyed a $6.34 billion boost in economic activity and created 79,000 jobs. The U.S. Consumer Financial Protection Bureau has accused the payday loan industry of “trapping borrowers in a cycle of debt.” Yet, only 15 states have banned this form of predatory lending. Recent data has shown that — not including online lenders — there are more than 24,000 payday loan locations nationwide. “Predatory lending is perhaps the most neglected justice issue in Baptist churches,” according to Robert Parham, executive director of the Nashville-based Baptist Center for Ethics (BCE), a CBF partner. Fortunately, there are a few exceptions to this troubling truth. Parham himself is one such exception having written many columns challenging Baptists on this subject. In 2010, Parham’s EthicsDaily.com, an imprint of BCE, produced an hour-long documentary on faith and taxes titled “Sacred Texts, Sacred Duty,” that featured Baptist pastors discussing the problem of predatory lending. Over the last few years, another CBF partner, the Texas Baptist Christian Life Commission (CLC), has led the charge for payday loan reform in that state, which is the corporate headquarters for industry giants Ace Cash Express, EZ Money and Cash America International. Until recently, the payday loan industry in Texas had been completely unregulated. “There were almost no controls or regulations in Texas. Lenders only had to register with the Texas Finance Commission,” said Stephen Reeves. In 2011, led by then-director Suzii Paynter and Reeves, the CLC formed a diverse faith-based coalition that successfully helped to pass two bills in the Texas legislature to regulate the payday industry. Now, the state is allowed to collect information about payday lenders and lenders are required to disclose to the borrower repayment amounts in two weeks, one month, two months and three months. Due to the intense lobbying efforts of the powerful payday industry, the CLC’s coalition was unable to set limits on payday fees. Nor was it able to cap the interest rate, averaging 417 percent. A second effort to reform the payday industry in Texas failed earlier this year, dying in committee having never received a vote. Baptists in other states have faced steep uphill fights too. The same year that the Texas CLC scored a small victory against the payday industry, Baptists in Missouri saw their efforts stalled in the legislature and then complicated by legal technicalities in 2012. Baptist leaders such as Jeanie McGowan joined up with other faith leaders to back a bill that would have capped the payday loan interest rate at 36 percent, prohibited loan renewals and mandated a 90-day payback period along with requires partial payments. When their effort bogged down in committee, these faith leaders launched a petition to get payday reform on the ballot, to allow Missourians the opportunity to vote to cap the interest rate at 36 percent. McGowan and staff and church members of FBC Jefferson City worked together to secure signatures on the petition. “We gathered twice as many signatures as we needed to get the measure on the ballots, but the payday industry outspent us on legalities, bringing up issues that could not be solved before the election,” McGowan said. When the legal firm representing payday lenders sent several clergy a threatening (and false) letter warning that their petition drive endangered the tax-exempt status of their churches — punishable by a fine or even jail time — McGowan did not cower. The failure to pass substantial legislative reforms has not slowed down Bryan Richardson and Charles Wedge, both associate pastors at First Baptist Church of San Antonio. “What struck us was that there was this need in our communities that could only be partially addressed by legislation. We knew there were people who desperately needed money,” Richardson noted. Through Together for the City, a loose consortium of San Antonio churches and civic leaders partnering to promote the common good, Richardson and Wedge participated in an effort to assess the impact of payday lending in their city and identify possible alternative lending models to pursue. “We looked for a holistic solution that encompassed financial education and a lending alternative that would foster financial growth among the economic underclasses of our community,” Wedge added. What Richardson, Wedge and the group came up with was an organization called Freedom First, set to launch later this year. Freedom First, in partnership with a community credit union, aims to help the working poor secure small loans and save money. “First Baptist Church has allocated monies that will help us to have meetings and do public relations. But, we’re not going to be the bank nor will other churches. The beauty is that these folks will be partakers of the financial system. They will be in the lending economy. That means that they can repair their credit, build up an emergency rainy-day fund and will also be members of a credit union,” Richardson said. Richardson hopes that Freedom First will prove to be an alternative lending model that can be replicated throughout the state. They believe innovative approaches such as theirs will be successful and prompt larger and much-needed conversations about meaningful reforms to the payday industry. Church for the Highlands, a CBF church start in Shreveport, La., is another church taking an imaginative approach to the problem of predatory lending. When pastor John Henson started the church barely three years ago, they received a small grant from CBF to begin a sustainable financial services ministry in their urban community, which featured a dozen payday lenders within a mile’s reach of the congregation. So, the church purchased an ATM. “We decided that to make a dent in [the payday problem] and see some change in the neighborhood, we’d have to start with something very simple like an ATM and find a way to build a little bit of trust,” Henson explained. In Louisiana, qualifying low-income residents are issued a debit card dubbed the “Louisiana Purchase Card” that allows those receiving cash benefits to withdraw the funds at participating ATMs. Conveniences stores in the Highland community hit customers with a $5 fee (or higher in some cases) to use their ATM. Church for the Highlands installed an ATM and charged only a nominal fee of 50 cents to pay for the machine’s operating costs. With the automated teller machine in place, Church for the Highlands added another inexpensive component to their financial ministry and become an Internal Revenue Service-certified tax assistance site, providing free tax filing assistance and helping low-income taxpayers to secure the benefits that they have earned. “We looked around the neighborhood and saw H&R Block, Walmart and others in the predatory lending business, doing tax preparation and offering ‘instant returns,’ which is a myth; there’s no such thing,” Henson pointed out. Tax preparers — an unregulated multi-billion dollar industry — such as Liberty Tax Service and Jackson Hewitt Tax Service (which operates in more than 2,000 Walmart stores), offers financial products that function as costly short-term loans with steep interest rates and exorbitant fees in exchange for tax preparation services. These products called Refund Anticipation Loans (RAL) and Refund Anticipation Checks (RAC) target low-income workers promising an “instant” or “quick” tax refund. While federally regulated banks have recently been forced out of the RAL business, payday lenders have swooped in to underwrite these tax-time loans. The third part of the church’s strategy was to partner with a credit union. “We partnered with a state credit union with a great reputation for helping low-income people and those with bad credit ratings,” Henson said. Out of this partnership, Pelican State Credit Union opened up a branch in the building where Church for the Highlands meets, the site of an old Baptist church that closed its doors in the 1990s and has been turned into a large community center operated by Volunteers of America. The facility now features nearly 40 different programs to help meet the needs of the Highland neighborhood. Henson and the congregation used part of its grant funds from CBF to collateralize loans that the credit union would provide to people in their community. “It’s become a really neat partnership,” Henson added. New businesses are being developed as a result of these loans. 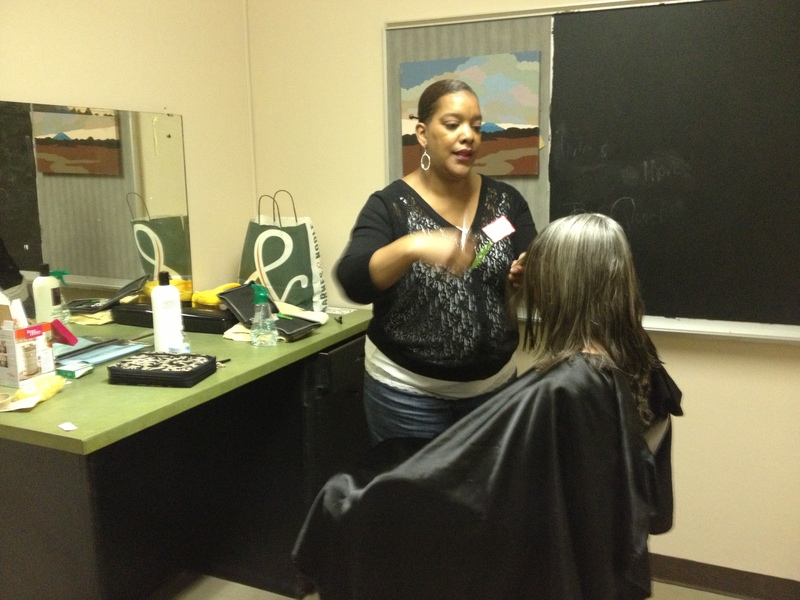 One Highlands member has started a small hair salon that operates in the community center where the church meets. The church co-signed a loan for the woman, who had overcome personal challenges, to purchase a stylist chair and other equipment. These partnerships and faith-based coalitions around the problem of predatory lending are transforming communities from Missouri to Texas to Louisiana. Although still a severely neglected justice issue among Baptists, these Baptists are putting forward models for other people of faith to follow. And in doing so, they are offering a reminder about our holistic role in God’s mission.